The American Kestrel is North America's smallest falcon. Its bold colors and patterns, small size and conspicuous behavior make it relatively easy to identify. It is often seen perched on power lines pumping its tail, or hovering over an open field in search of its prey. While populations appear fairly stable in Tennessee, it is declining in parts of its range, primarily due to the lack of available natural cavities and human development. As is the case with other beneficial predator species, the kestrel plays an important role in keeping insect and small rodent populations in check. The American Kestrel has a small body with a rounded head and long pointed wings and tail. Both sexes are brightly colored and have pairs of black slashes or "sideburns" on the sides of their pale faces. 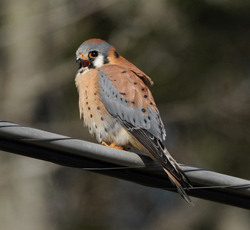 Kestrels are well known for teet-tottering and wagging and pumping their tails when perched on power lines. Adult male: a slate-blue head and wings contrasting with rusty red back and tail, paler below with black spots. Adult female: larger than the male with brownish head, wings and tail. The back and tail have black barring. Immature American Kestrel, note extensive streaking on the breast. Open areas such as farms, pastures with widely scattered trees, and along roadsides or power line rights of ways. Primarily large insects, but also small mammals, reptiles, amphibians, and small birds. Most common call is a loud, excited series of 3-6 "klee!" or "killy!"notes. A fast chitter or a long whine is sometimes heard among pairs and families. As cavity nesters, the American Kestrel traditionally relied on abandoned woodpecker holes, natural tree hollows, rock crevices, and nooks in buildings located along wooded edges or in the middle of open ground. Kestrels will readily use nest boxes. Clutch Size: Usually 4 to 5 eggs which are white to yellowish to pale brown with violet to brown mottling. Incubation period: Both male and female incubate the eggs for 29 to 31 days. Young begin hunting shortly after leaving the nest, but the parents continuing to feed them for another 2 weeks. •	The Kestrel will hide surplus kills in grass clumps, tree roots, bushes, fence posts, tree limbs, and cavities to save the food for lean times or to hide it from competing hunters. •	"Hover-hunting," often seen along roadsides, is used most often when there are no suitable perches available. •	The females arrive first on the wintering grounds and establish their territories in the preferred open areas. The males, arriving later are forced to use areas with more trees. •	Nestlings squirt their feces onto the walls of the nest cavity. The feces dry on the cavity walls and stay off the nestlings. There is one typical box design for American Kestrels, which also happens to be a design for Eastern Screech Owl. Use natural, uncoated wood such as cedar or redwood which are more durable than pine or exterior plywood. Use at least ¾ inch boards. Your Kestrel box should be in place by late winter. Place the box on a pole, tree or outbuilding with the cavity entrance 10 to 30 feet above the ground and facing southeast to avoid direct winds. Ideally, the box should be surrounded by at least an acre of open field and within 20 yards of a tree with dead limbs, a utility pole, or other structure to serve as a hunting perch. If placing more than one box, place the boxes at least one half mile apart. To reduce competition for nest cavities from squirrels, it is advised to place the box 50 yards from a forest edge. 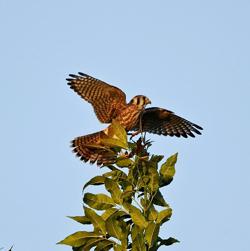 In agricultural areas, place the box a substantial distance from fields treated with pesticides, since insects are the primary food source for kestrels. Using a predator guard is very important in establishing a successful nesting box. Monitoring all boxes you plan to erect is very important to the success of your targeted nesting birds. We do not recommend installing a nest box if you do not plan to monitor it. Proper placement of the box will help to reduce the problem of cavity nesting competitors. However, even the best placed box can be attractive to European Starlings. It is important to monitor the box and remove European Starlings' nests and eggs. Erect only as many boxes as you can properly monitor and maintain. Boxes should be visited no more than 4 to 5 times each year. Territorial behavior begins 3 to 4 weeks prior to laying eggs. The first visit to the nest box should begin before this time. Begin observing the area and box in mid-March through late June from a distance to determine if nesting activity is taking place. Territorial behavior includes frequent entering and exiting of the nest box by both male and female. Visit 1: The box should be cleaned out and repaired, if necessary. Add 2 to 3 inches of wood chips or shavings to the box floor. Visit 2: 10 to 14 days after the male is seen bringing food to the nest carefully open the box to check and record the number of eggs. Visit 3: By adding 45 to 50 days to the estimated date of the last egg laid, you can calculate the best time to visit the third time, which should be about 2 weeks prior to the fledging date. Use extreme caution when opening the box to prevent nestlings from prematurely fledging. Visit 4: This should occur after you have observed that the nestlings have fledged. Box should be cleaned and remain outside to provide winter cover.